We offer Australia Post Parcel Post for $10.00, Australia Post Express Post for $14.95 and FREE Parcel Post on ALL orders $250 and over (domestic only). Orders are sourced and dispatched nationwide. Alannah Hill endeavours to dispatch all orders within 2-5 business days of receiving the order. Some items are of limited stock and may take up to 10 business days to source. Customers will be notified of any dispatch delays. Once your order is placed, we cannot cancel or amend it as we begin sourcing/packing right away. Please allow 10 working days for delivery during sale periods. Items may be delivered to you individually and/or separately as they are fulfilled from different locations. Alannah Hill Online recommends customers provide a secure delivery address, for example your place of employment. Alannah Hill Online is not responsible for lost/stolen parcels. Click and Collect is a postage option that allows you to place an order online and then collect in store. Exchanges can be processed on click and collect orders in store. Refunds can only be processed through online. Please allow 48 hours for the funds to clear. Refunds will automatically go back onto the original method of payment. Please note, that we do not ship to ALL countries and highly recommend using a business address for delivery. If your country is NOT included in the "estimate shipping and tax" drop down, then we DO NOT ship there. Orders are sourced and dispatched nationwide using Aus Post Express Courier International. We aim to dispatch orders within 2-5 business days after purchase. Some items are of limited stock and may take up to 10 business days to source. There is no GST charged on international orders. We maintain price parity between local and offshore customers. There are additional charges for handling of international orders. Full-priced items: can be returned for an online credit (valid 3 months), an exchange where product is available or a full refund of the item(s) excluding shipping costs. Sale & promotional items: can be returned for an online credit (valid 3 months) or an exchange where product is available. Outlet items: can be returned for an online credit (valid 3 months) or an exchange where product is available. Afterpay items can be returned for an online credit (valid 3 months) or a refund if full price. Afterpay purchases cannot be exchanged. The item(s) must be unworn, unwashed, unused, in original condition with all labels / tags attached and returned within 14 days of receiving your product. For hygiene and health reasons, we do not accept swimwear, earrings, hosiery, and hair accessories, unless the item is faulty. During sale periods, returns may take up to 10 business days to process. Proof of online purchase/order number must be filled out on the returns form. Important: Returns will not be accepted without a completed returns form. Returns are only accepted via post and not in person. Should you receive a faulty or damaged item, please contact our customer service team on +613 8420 0388 or via contactus@alannahhill.com.au and we will instruct you on how to return the item. We have partnered with AusPost to make your Alannah Hill online return easier. Please visit https://returns.auspost.com.au/alannah-hill-returns/ and follow the prompts. The link provided below only applies to domestic customers. Please use your international postal service if you are mailing from abroad. You will need to enter your full 9 digit order number into both the order number and R/A number (Return authorisation number) section on the returns page. The Alannah Hill online store is not liable for the loss of an item/s being returned using this service. Please refer to the Australia Post website for Terms and Conditions. We recommend retaining your parcel lodgement receipt as this contains your tracking number. Alannah Hill online do not accept postal returns on items purchased in store. If you require an exchange, please note that exchanges are subject to online availability. If your item is not available at the time of processing you will receive a refund or online credit, dependent on whether the returned item was full price or sale. We cannot pre order or hold stock. When returning shoes, shoe boxes must be intact. In-Store Exchange: All Alannah Hill online orders are able to be exchanged instore, excluding ''Online Exclusives'' products. Customer's have 14 business days to exchange. David Jones concessions are unable to accept online exchanges. A printed copy of the order email is required when making an exchange. Please note that The Alannah Hill boutiques can only exchange for items of the equal value or more. Boutiques are unable to issue refunds or credit notes. The Alannah Hill online store will not credit customs and duties paid on your order; this must be pursued by customers within their own jurisdiction. As the Alannah Hill online store is not liable for the loss of the item being returned, we recommend sending your parcel with a traceable service. After Pay purchases will not be accepted in Boutiques or Outlets. We are not required to provide a refund if you change your mind. However, on sale items we will happily offer you an exchange within 14 days with proof of purchase. Items sold at regular retail price that are unwashed, unworn and unused in their original condition may be returned within 14 days with proof of purchase for an exchange. For health reasons, there are no returns or exchanges on the purchase of bathers or earrings unless exhibiting a genuine manufacturing fault. Alannah Hill Online: Items purchased through Alannah Hill Online can be exchanged in store within 14 days of purchase with proof of purchase. However, we cannot process refunds or offer credit notes for Alannah Hill Online purchases in store. ZipPay Purchases: Purchases made in store using ZipPay can be exchanged or refunded within 14 days of purchase and with proof of purchase according to the guidelines set above for full price, sale items, promotional items, and faulty items. 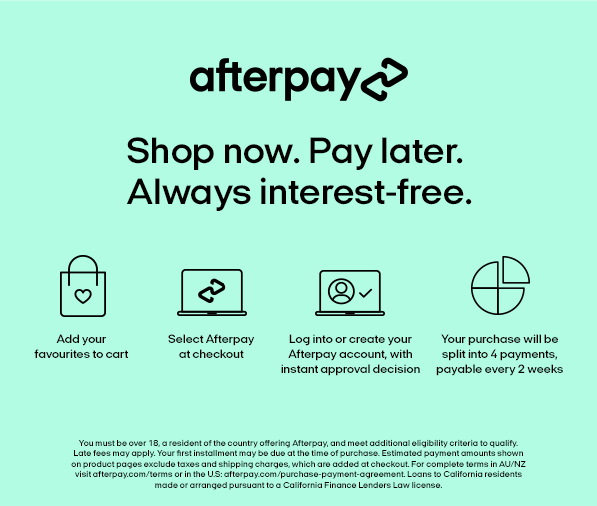 Afterpay Purchases: Purchases made through Alannah Hill Online using Afterpay cannot be exchanged or refunded in-store. If you wish to return an online purchase made using Afterpay, please follow the return instructions provided under the 'Afterpay Online Returns' tab above.